Stretching across much of northern China and southern Mongolia, the Gobi Desert is one of the least hospitable places on Earth. It’s hot, barren, and there are few places to pick up a slurpee. Home only to nomadic tribes and their hardy livestock, the Gobi is seldom visited by outsiders. (In fact, until the late 1980’s the communist governement didn’t allow visitors.) For this reason alone, it’s not unthinkable that a desert-dwelling animal might have escaped the scrutiny of modern science. Ask most residents of the Gobi what creature terrifies them the most and you’re likely to get a single answer—the allerghoi khorkhoi or intestine worm. (So called because it resembles the intestine of a cow.) Though its never been captured on film, Mongolians describe the creature as two feet in length and several inches wide. It has no visible mouth or eyes. Not very frightening, you say? 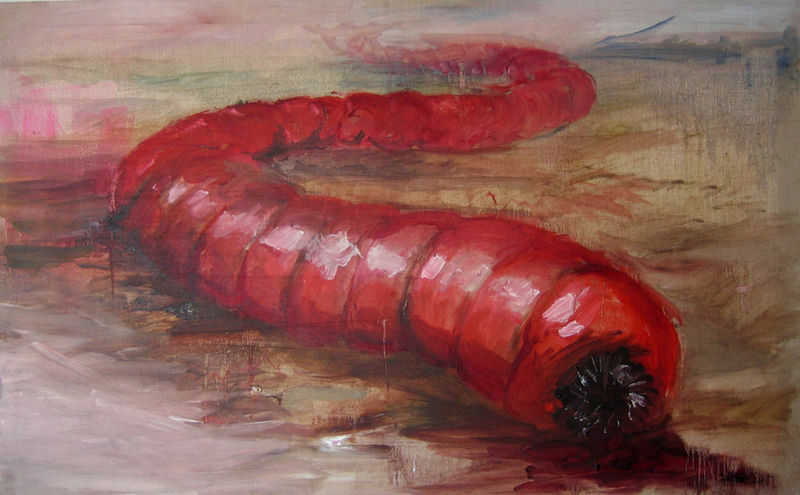 Well the Mongolian Death Worm boasts two special talents. It squirts a deadly, acid-like venom with remarkable accuracy and can release an electric shock powerful enough to kill a camel. Needless to say, it’s not very friendly. For decades, Western travelers have heard tales of the allerghoi khorkhoi, and many have left the desert believers. But despite countless reputable eyewitnesses, many outside of the Gobi will refuse to believe the stories until the beast is finally filmed in action. Gross. You just scared me out of ever wnting to go there.